It is, therefore, speculated that periodontitis results in low-grade systemic inflammation, which may cause lower number of erythrocytes and, consequently, lower hemoglobin (Hb) concentration. , However, conflicting results have been reported regarding the association of periodontal disease and anemia. 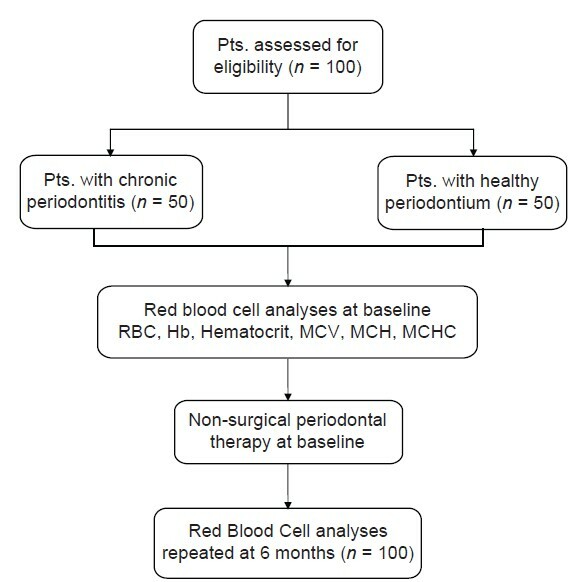 The purpose of this study is to investigate whether patients with chronic periodontitis have an anemic status and the effect of non-surgical periodontal therapy on red blood cell (RBC) analyses of patients with chronic periodontitis over a 6-month period. In this 6-month follow-up randomized controlled double-blind study, male patients of age between 20 and 50 years were selected from the outpatient department. The patient and the pathologist who performed the blood analysis were blinded to the study. The intra-oral examination was done by a single examiner to reduce error. A detailed systemic and family history was recorded. Patients with a history of systemic diseases or conditions that may adversely affect periodontal health were excluded from the study. The exclusion criteria for the study were as follows: (1) female patients; (2) smokers; (3) history of periodontal treatment or use of vitamin, antibiotics, or iron supplements within previous 6 months; (4) individuals who suffered from any acute or chronic medical conditions including diabetes, or viral, fungal, or bacterial infection; and (5) individuals who suffered from malaria or jaundice in the last 1 year [Table 1]. Clinical parameters assessed were probing pocket depth (PPD), clinical attachment loss (CAL), gingival index (GI), and plaque index (PI). 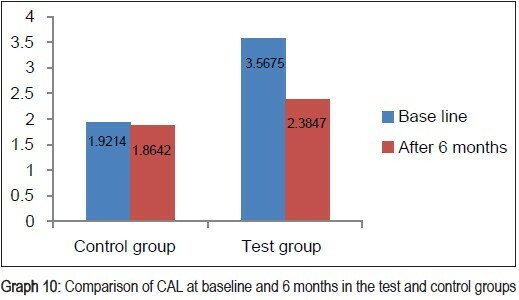 Patients diagnosed with chronic periodontitis, having a probing depth of ≥5 mm in >30% sites and CAL ≥ 2 mm at 30% sites,  were included in the test group (n = 50). 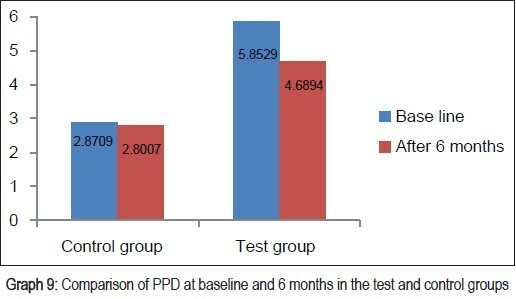 The control group (n = 50) included periodontally healthy male patients with no PPD and CAL [Figure 1] and [Figure 2]. Patients were informed regarding the benefits and protocol of the study and a written informed consent was taken from all the patients. At baseline: All the blood samples of the test and control groups were assessed at the pathology laboratory. Ten milliliters of venous blood samples were collected by venipuncture under aseptic conditions in the antecubital fossa. The blood was transferred into ethylenediaminetetraacetic acid containing bulbs. The samples were processed within 4 h of collection in an automated hematology analyzer and semi-automated (ok) 3-part differential cell counter ACT-8 Beckham Coulter. The parameters assessed were RBC count, Hb concentration, hematocrit value, mean corpuscular volume (MCV), mean corpuscular hemoglobin (MCH), and mean corpuscular hemoglobin concentration (MCHC). Non-surgical periodontal therapy consisting of scaling and root planing was performed on patients in the test group (n = 50) and oral prophylaxis was performed in the control group (n = 50). Oral hygiene instructions were given to the patient. Patients were advised to use 0.2% chlorhexidine mouthwash, 10 ml twice daily for 15 days. At 6 months: Patients of the test and control groups were recalled. Clinical parameters and RBC parameters were re-assessed and oral prophylaxis was performed. Oral hygiene instructions were given to the patient. 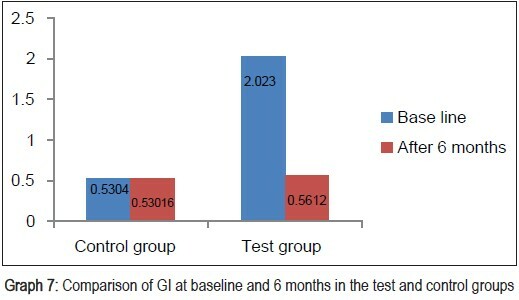 Student's t-test was performed with appropriate Microsoft Excel software for a comparative analysis of outcome parameters between test and control groups at baseline and 6 months. Means and standard deviations of all the parameters were calculated for both groups. To illustrate the differences between groups, two-tailed P value was used, which was considered statistically significant if <0.05. The mean and standard deviation of all blood and clinical parameters in the test and control groups are presented in [Table 2] and [Table 3], respectively. 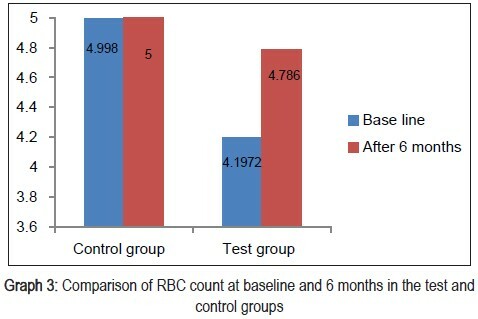 Hb concentration, hematocrit value, and RBC count in the test group at baseline were below the normal reference range [Table 2], Graphs 1-3], whereas in the control group, they was well within the normal reference range [Table 3], Graphs 1-3]. This suggested that patients with chronic periodontitis had Hb concentration, hematocrit value, and RBC count below the normal reference range at baseline, as compared to the controls at baseline. 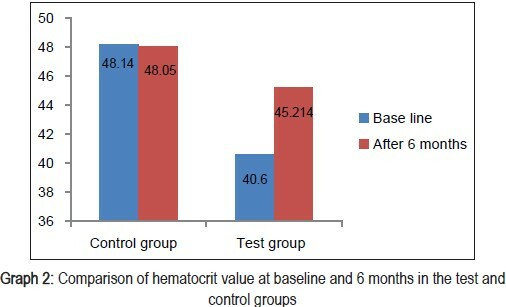 At 6 months after non-surgical periodontal therapy, Hb concentration, hematocrit value, and RBC count in the test group showed a statistically significant increase, indicating that non-surgical periodontal therapy has a positive effect on the anemic status of the patients [Table 2] and [Table 3], Graphs 1-3]. MCV, MCH, and MCHC values at baseline in the test as well as the control group were well within the normal reference range [Table 2] and [Table 3], Graphs 4-6], indicating that patients with chronic periodontitis had ACD which is a normocytic, normochromic anemia. Clinical parameters measured showed a statistically significant decrease from baseline to 6 months after non-surgical periodontal therapy in the test group [Table 4], Graphs 7-10]. 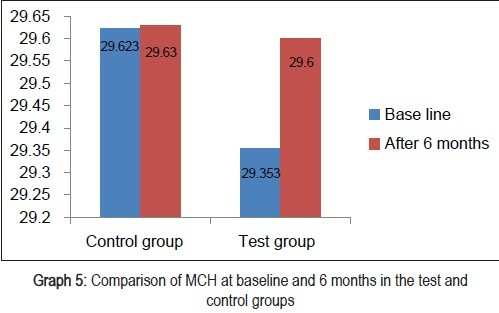 Clinical parameters in the control group were within the normal reference range at baseline and 6 months [Table 5], Graphs 7-10]. 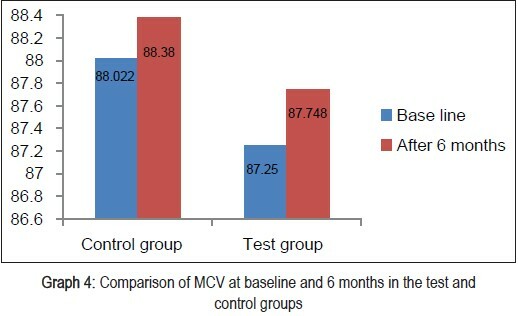 The Hb concentration, hematocrit value, and RBC count in the test group at baseline were below the normal reference range, whereas the MCV, MCH, and MCHC were in the normal reference range. These results are in accordance with the results of the studies conducted by Lainson et al.,  Hutter et al.,  Gokhale et al.,  and Naik et al. Aljohani et al. and Wakai et al. in their studies found no correlation between Hb levels and periodontal status, when they compared Hb levels in patients with periodontitis of different severity, whereas in the present study, Hb level in periodontitis patients versus healthy controls was compared. 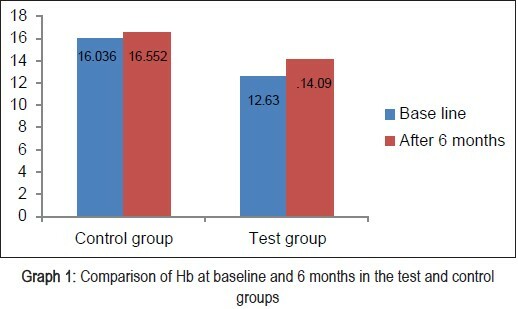 After non-surgical periodontal therapy which included scaling and root planing, a statistically significant increase in the Hb concentration, hematocrit value, and RBC count in the test group at 6 months was seen. These results are in accordance with the results of the studies conducted by Hutter et al.,  Gokhale et al.,  Naik et al., and Pradeep et al. According to these authors and a few studies ,,,,,,, in the past, periodontitis patients have elevated levels of acute phase proteins, interleukin (IL)-1, IL-6, and tumor necrosis factor (TNF). These inflammatory mediators are shown to suppress mature erythroid progenitors  and inhibit in vitro colony formation by erythroid burst-forming units and erythroid colony-forming units from normal human marrow. ,, Inhibition of erythropoietin, the hormone responsible for erythropoiesis, was also seen. This leads to decrease in RBC count. The present study shows an association between chronic periodontitis and signs of anemia, which suggests a measurable effect of periodontitis on the systemic condition of the patient. This study also suggested that non-surgical periodontal therapy had a positive effect on the Hb count, RBC count, and hematocrit value at the end of 6 months. Decreased MCV values suggest microcytosis which is most commonly caused by iron deficiency anemia and elevated levels of MCV suggest macrocytosis caused by vitamin deficiency. 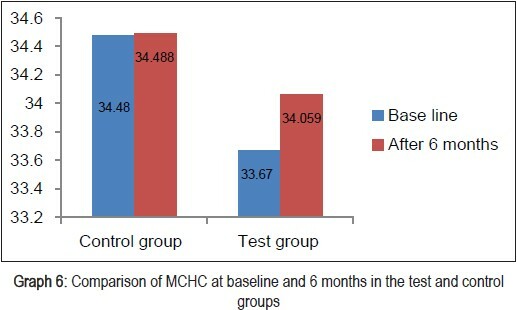 In this study, MCV values were in the normal reference range for both chronic periodontitis group and periodontally healthy group at baseline as well as 6 months post non-surgical periodontal therapy. This suggested that the anemic status was not due to iron deficiency or vitamin deficiency, as the MCV values decrease or increase in such conditions. The limitation of this study was that an analysis of serum ferritin levels and the soluble serum transferring receptor concentration, or a bone marrow examination was necessary to quantify the iron stores and definitely distinguish between ACD and iron deficiency anemia. Another limitation of the study was the small sample size. Therefore, further studies with a larger sample size should be conducted and the serum ferritin levels must also be assessed. A correlation was found between chronic periodontitis and decreased levels of Hb, hematocrit value, and RBC count, suggesting that anemia is induced by inflammation caused in patients suffering from periodontal disease. The study also provides evidence that non-surgical periodontal therapy can improve the anemic status of the patients. Further cohort studies with a larger sample size are needed to find an association between chronic periodontitis and anemia and the effect of periodontal treatment on the anemic status of these patients. 1. Malhotra P, Kumari S, Kumar R, Varma S. Prevalence of anemia in adult rural population of North India. J Assoc Physicians India 2004;52:18-20. 2. Weiss G, Goodnough LT. Anemia of chronic disease. N Engl J Med 2005;352:1011-23. 3. Means RT Jr, Krantz SB. Progress in Understanding the pathogenesis of the anemia of chronic disease. Blood 1992;80:1639-47. 4. Pradeep AR, Anuj S. Anemia of chronic disease and chronic periodontitis: Does periodontal therapy have an effect on anemic status? J Periodontol 2011;82:388-94. 5. Naik V, Acharya A, Deshmukh VL, Shetty S, Shirhatti R. Generalized, severe, chronic periodontitis is associated with anemia of chronic disease: A pilot study in urban Indian males. J Invest Clin Dent 2010;1:139-43. 7. Lainson PA, Brady PP, Fraleigh CM. Anemia, a systemic cause of periodontal disease? J Periodontol 1968;39:35-8. 8. Gokhale SR, Sumanth S, Padhye AM. Evaluation of blood parameters in patients with chronic periodontitis for signs of anemia. J Periodontol 2010;81:1202-6. 9. Aljohani HA. Association between hemoglobin level and severity of chronic periodontitis. JKAU: Med Sci 2009;17:53-64. 10. Wakai K, Kawamura T, Umemura O, Hara Y, Machida J, Anno T, et al. Associations of medical status and physical fitness with periodontal disease. J Clin Periodontol 1999;26:664-72. 11. Noack B, Genco RJ, Trevisan M, Grossi S, Zambon JJ, De Nardin E. Periodontal infections contribute to elevated systemic C-reactive protein level. J Perodontol 2001;72:1221-7. 12. Paraskevas S, Huizinga JD, Loos BG. A systematic review and meta-analyses on C-reactive protein in relation to periodontitis. J Clin Periodontol 2008;35:277-90. 13. Mealey BL, Klokkevold PR. Periodontal medicine. In: Newman MG, Takei HH, Carranza FA, editors. Carranza's Clinical Periodontology, 9 th ed. Philadelphia: Saunders; 2002. p. 229-44. 14. D'Aiuto F, Parkar M, Andreou G, Suvan J, Brett PM, Ready D, et al. Periodontitis and systemic inflammation: Control of the local infection is associated with a reduction in serum inflammatory markers. J Dent Res 2004;83:156-60. 15. D'Aiuto F, Nibali L, Parkar M, Suvan J, Tonetti MS. Short-term effects of intensive periodontal therapy on serum inflammatory markers and cholesterol. J Dent Res 2005;84:269-73. 16. Ide M, Jagdev D, Coward PY, Crook M, Barclay GR, Wilson RF. The short-term effects of treatment of chronic periodontitis on circulating levels of endotoxin, C-reactive protein, tumor necrosis factor-alpha, and interleukin-6. J Periodontol 2004;75:420-8. 17. Noack B, Genco RJ, Trevisan M, Grossi S, Zambon JJ, De Nardin E. Periodontal infections contribute to elevated systemic C-reactive protein level. J Periodontol 2001;72:1221-7. 18. Loos BG, Craandijk J, Hoek FJ, Wertheim-van Dillen PM, van der Velden U. Elevation of systemic markers related to cardiovascular diseases in the peripheral blood of periodontitis patients. J Periodontol 2000;71:1528-34. 19. Johnson CS, Keckler DJ, Topper MI, Braunschweiger PG, Furmanski P. In vivo hematopoietic effects of recombinant interleukin-la in mice: Stimulation of granulocytic, monocytic, megakaryocytic, and early erythroid progenitors, suppression of late erythroid progenitors, and reversal of erythroid suppression with erythropoietin. Blood 1989;73:678-83. 20. Maury CP, Andersson LC, Teppo AM, Partanen S, Juvonen E. Mechanism of the anaemia in rheumatoid arthritis: Demonstration of raised interleukin- lß concentrations in anaemic patients and of interleukin 1 mediated suppression of normal erythropoiesis and proliferation of human erythroleukemia (HEL) cells in vitro. Ann Rheum Dis 1988;47:972-8. 21. Means RT Jr, Dessypris EN, Krantz SB. Inhibition of human erythroid colony-forming units by interleukin-1 is mediated by gamma interferon. J Cell Physiol 1992;150:59-64. 22. Zoumbos NC, Djeu JY, Young NS. Interferon is the suppressor of hematopoiesis generated by stimulated lymphocytes. J Immunol 1984;133:769-74. 23. Faquin WC, Schneider TJ, Goldberg MA. Effect of inflammatory cytokines on hypoxia-induced erythropoietin production. Blood 1992;79:1987-94. 24. Nemeth E, Valore EV, Territo M, Schiller G, Lichtenstein A, Ganz T. Hepcidin, a putative mediator of anemia of inflammation, is a type II acutephase protein. Blood 2003;101:2461-3. 25. Ganz T. Hepcidin and iron regulation, 10 years later. Blood 2011;117:4425-33. 26. Scannapieco FA. Position paper. Periodontal disease as a potential risk factor for systemic diseases. J Periodontol 1998;69:841-50. 27. Amar S, Chung KM. Effects of hormonal variation on the periodontium in women. Periodontol 2000 1994;6:79-87. 28. Bergstrom J. Tobacco smoking and risk for periodontal disease. J Clin Periodontol 2003;30:107-13. 29. Haffajee AD, Socransky SS. Relationship of cigarette smoking to attachment level profiles. J Clin Periodontol 2001;28:283-95. 30. Erdemir EO, Nalcaci R, Caglayan O. Evaluation of systemic markers related to anemia of chronic disease in the peripheral blood of smokers and non-smokers with chronic periodontitis. Eur Dent J 2008;2:102-9. 31. Tappia PS, Troughton KL, Langley-Evans SC, Grimble RF. Cigarette smoking influences cytokine production and antioxidant defenses. Clin Sci 1995;88:485-9.